Made of bronze 3/8" to 1/2" thick. The Man on the Cross weighs seven tons and is twenty-eight feet tall from head to toe. Be one of the 275,000 to 325,000 people that come visit the Cross in the Woods every year! 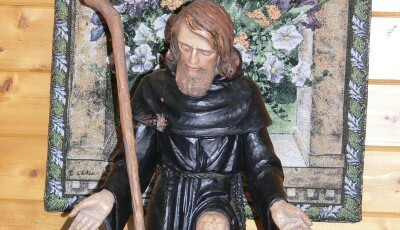 The present statue of St. Francis was added to the shrine in 1994 and is the work of James Hopfensperger of Midland, Michigan. Located in the lower grounds of the Shrine. 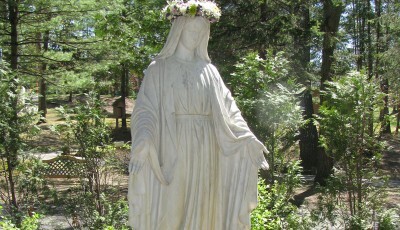 She has been the patroness of millions of travelers and pilgrims who visit the Cross In The Woods. Peregrine is the patron of those who suffer from cancer and HIV/AIDS. 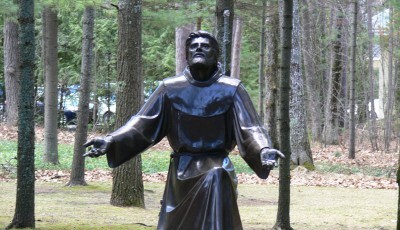 The statue lives in a gazebo which provides a place for reflection and prayer. 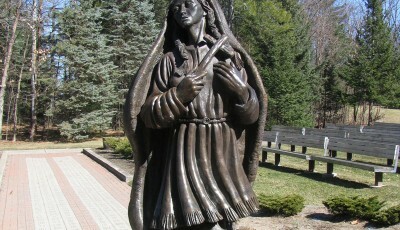 The bronze statue of Kateri Tekakwitha, created by Canadian sculptor, Timothy P. Schmalz, was placed on the grounds during the summer of 2001. 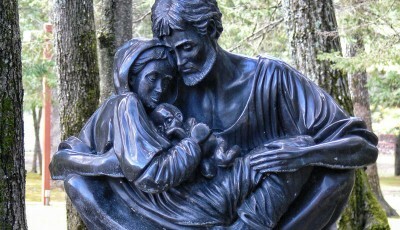 Located in the outdoor sanctuary part of the Shrine, this statue is meant to represent family intimacy. It was built by the sculptor, Timothy P. Schmalz and titled A Quiet Moment. Born August 12th, 1852 in Waterbury, CT, Fr. 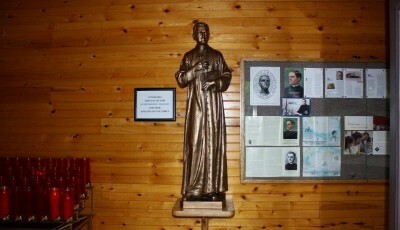 Michael McGivney was declared Venerable in 2008 by Pope Benedict XVI. Walk the church grounds and enjoy the serenity from Dawn to Dusk. There are no fees or admissions but your generosity in donations is welcomed. Enjoy reading the Daily Readings from the United States Conference of Catholic Bishops.